Get to know us before you contact us. We are a friendly, down to earth family providing quality service to you and your home! Hi, my name is Kathy Smith. I started Tropical Water Gardens in July 2006 because of the difficulty I had finding supplies for two ponds I built at my home earlier in the Spring. I wanted to build a tropical garden area full of palms and other tropical plants surrounding two ponds connected by a stream. After considerable research on the internet, I ordered the pond components online. An upper pond holding 500 gallons was stocked with gold fish. A ten foot stream connected to the lower pond which held 1,000 gallons had colorful koi. Even though this arrangement looked like one system, it was actually two separate ponds circulating independently of each other. The project was completed on May 13, 2006--just in time for me to enjoy Mother’s Day in my beautiful and relaxing new tropical garden! Then the problems—and the learning—began. Little did I know that my ponds were going to be such high maintenance items due to the way I had put them together. The upper pond had gone through a metamorphosis: It turned green like pea soup. A few weeks after adding some beneficial bacteria, the pond cleared up. Unfortunately, after four months the lower pond was still green...yuck! I constantly had to clean the filter in both ponds. ​FINDING A BETTER WAY: The AQUASCAPE EcoSystem! I knew there had to be a better way to build a water garden, one that would let me enjoy it rather than be constantly maintaining it. My research led me to Aquascape, Inc. and I started attending classes. Aquascape has a proven system for installing water gardens that are ecologically balanced and virtually maintenance free. 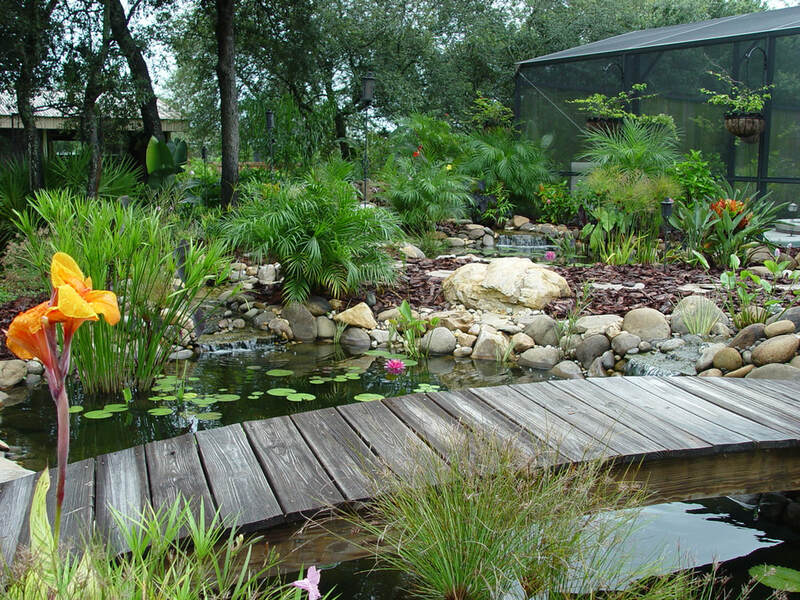 This allows you to enjoy your beautiful fish and pond without the bother of constant maintenance. In October 2006, I built my first Aquascape pond. It is so enjoyable to sit in the swing by the pond and watch the fish do their job...eating the stuff off of the rocks. Koi have such wonderful personalities and they are all different! The only place I could find fish was in a local pet shop and Wal-Mart. The variety of koi was very limited at the pet shop and at Wal-Mart they were diseased. So, I found a fish farm that has everything you could possibly be looking for in gold fish and koi. Aquatic plants were even more difficult to find! I also found a local supplier of aquatic plants and then built a greenhouse and started growing and experimenting with my own beautiful aquatic plants. We now grow 20+ varieties of marginal plants, lotus, hardy and tropical water lilies. I figured that if I had a difficult time finding supplies and help locally, there must be others out there with the same problem. So I started my business to be able to serve YOU! In December 2006, I tore out my original ponds and built them the right way! I made them larger and all one system. I also added five waterfalls. There is a wooden bridge going over the lower pond. Nothing beats the sound of running water in streams and waterfalls! As part of my learning process I worked with other contractors in Florida and Virginia building ponds the Aquascape way. 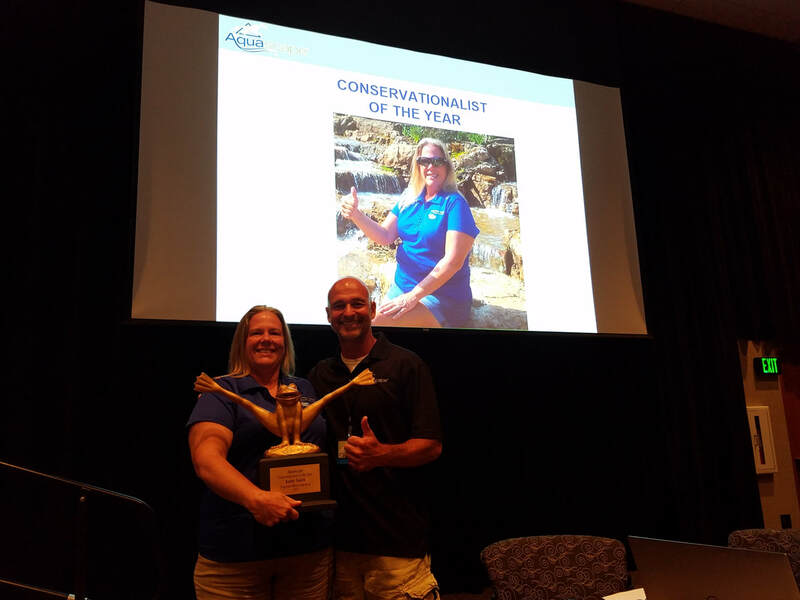 ​Kathy Smith of Tropical Water Gardens receives the prestigious title of Conservationalist of the year in August on 2017! She is a most deserving recipient of this award as she lives her life as a conservationist to the fullest in her installations. Nearly every install is sustainable with rainwater harvesting. For the past 6 - 7 years, we have focused on installing sustainable water features. I am so honored to have been awarded Aquascape’s Conservationist of the Year at Pondemonium 2017. The Pond Squad (previously known as the Pond Stars) is a reality show following the wild world of pond building, as the talented team transforms uninspired spaces into water feature wonderlands. 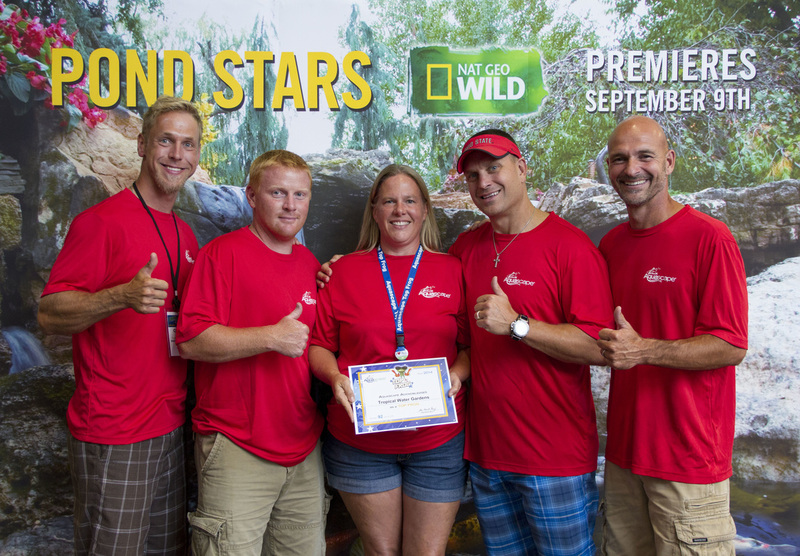 Not only do I know the stars of Pond Squad, I have worked hand in hand with them on multiple builds in the US, Africa and the Dominican Republic. The Pond Squad (previously known as "Pond Stars") episodes can be watched on YouTube. ​Top Frog Award is an award presented by Aquascape recognizing the top 100 Aquascape Contractors & Retailers in the world. Tropical Water Gardens has been presented this award each year since 2014 and is very proud to be part of this group. 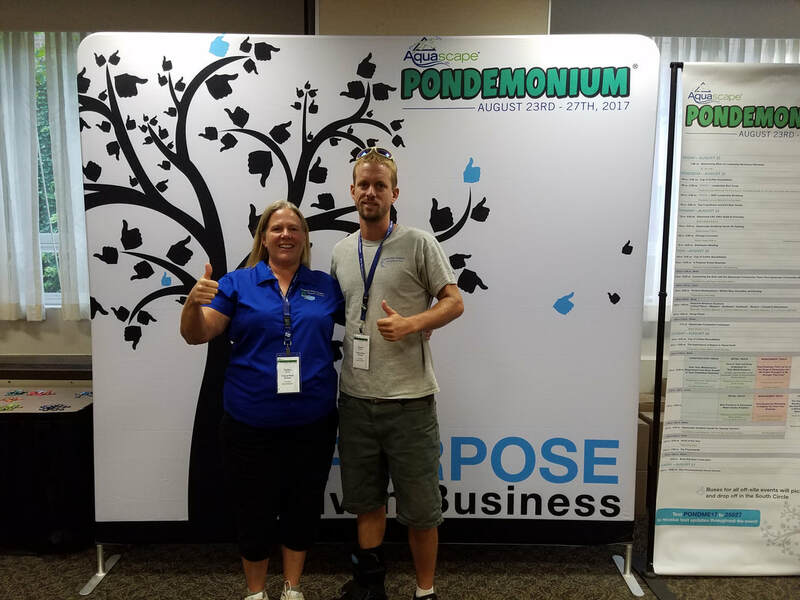 Pondemonium is the largest Pond Industry Training Event in North America. It is held at Aquascape Headquarters each year for contractors, retailers, distributors, or anyone looking for a new business opportunity with water features. Tropical Water Gardens looks forward to attending this week long event each year to continue our education and stay up on the latest in this exciting industry. We also look forward to networking with our friends and fellow pond family members from around the word. See the link below for highlights from the 2017 event. ​Over the years, I have been a guest on WDSC's live TV shows, "The Gardener's Hotline" It is a live call in show and I talked about EcoSystem Ponds and Aquatic Plants. I was on the show in 2008 and then again in 2014. We had a lot of fun answering the caller's questions. I have been growing my own aquatic plants for many years now and have learned from trial and error, what plants work well in Florida water features and what ones are too invasive. 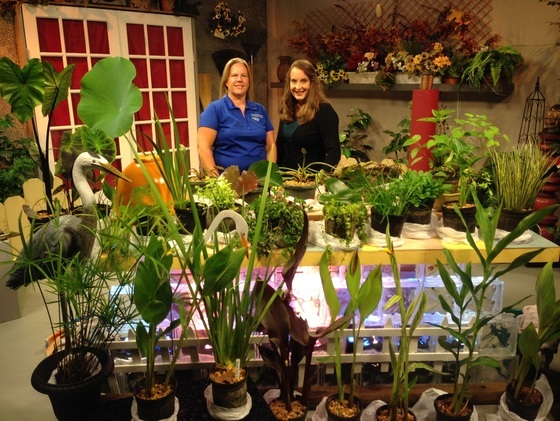 I was also a guest on the TV show "House to Home" in 2008 and spoke on ecosystem ponds and water features. You can watch the shows on our Portfolio Video page by clicking here. 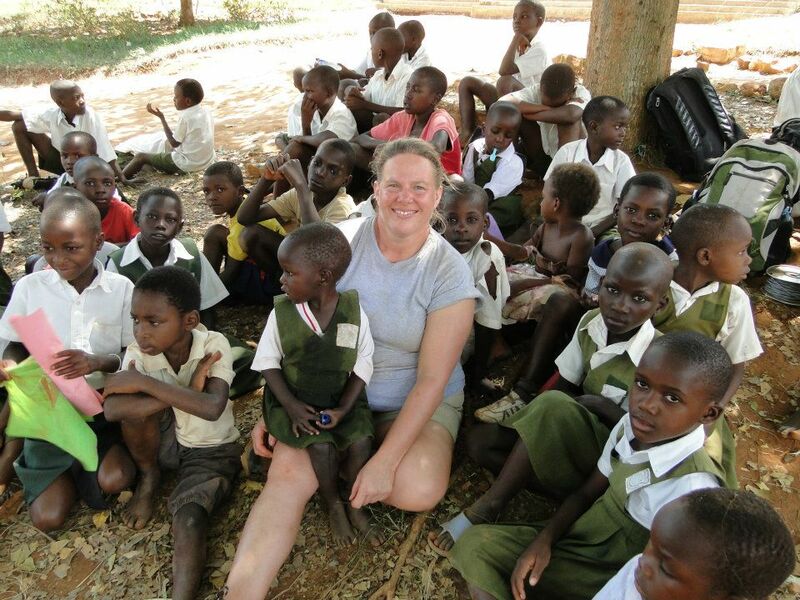 Kathy Smith of Tropical Water Gardens in Kiyindi, Uganda January 2012 to help install a 20,000 gallon rainwater harvesting system at a International Needs Network School. 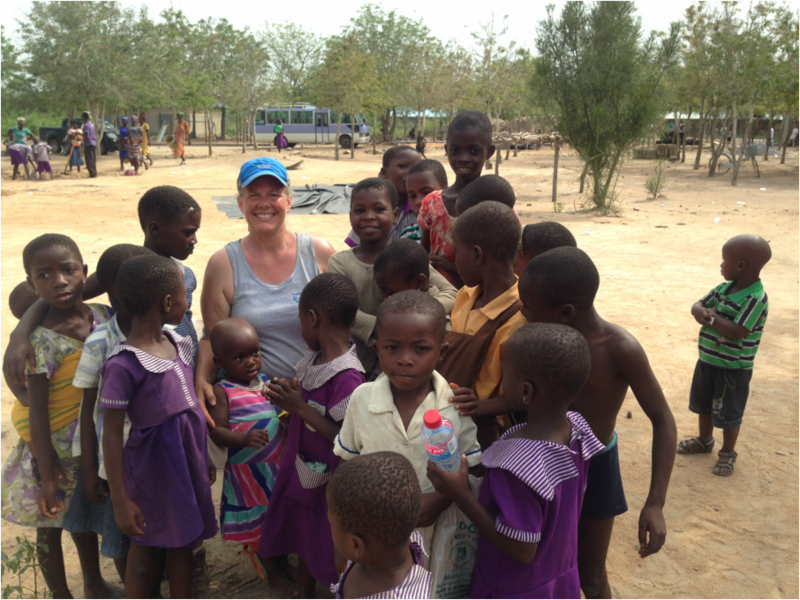 The newly installed RainXchange® rainwater harvesting system provides clean drinking water for approximately 900 school children year-round and creates the ability to prepare one hot meal per day. Read the complete press release here. Click here to view the article I was featured in published by Aquascape Inc. in October 2010 called "Florida Pond Hobbyist Turns Pro". It was an honor to be profiled on their web site! 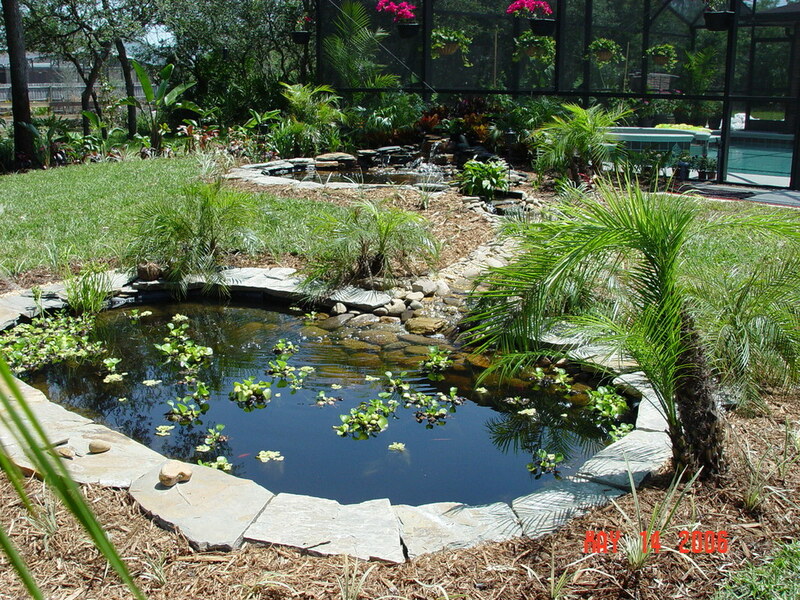 We have installed many ponds, waterfalls and decorative features throughout Volusia, Flagler, Sumter, Brevard , Orange and Seminole Counties. We have an extensive portfolio we would love to share with you and show you how we can transform your yard into your own piece of paradise!! ​My son, Shaun, works with me. He has developed an artistic eye for creating beautiful, natural looking waterfalls. 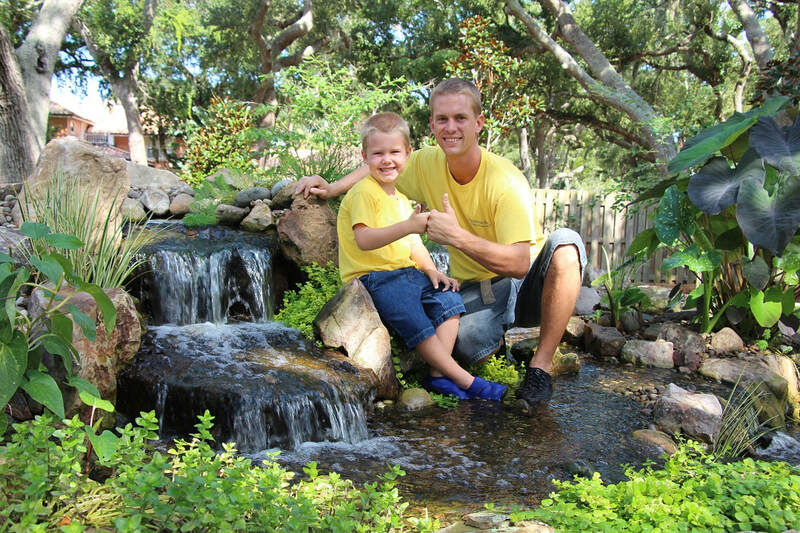 As we continue to work together one water feature at a time, we get to share our love for the water garden lifestyle with so many wonderful families, that become part of our Pond Family! Let us Aquascape you...then you can enjoy paradise in your own backyard!